« Does What You’re Doing Make You Money Or Save You Money? You know that to be effective with your website, you have to get people to look at it. Without traffic the best website in the world cannot actually do what it was designed to do, increase your leads and customers. However, there seems to be two different thoughts on the type of traffic you actually get on your website. On the one side there are those who say get as many people as possible to see what you have to offer, whilst the other side say’s to only get people to visit who definitely going to be interested in your offer. There is an old saying which goes “If you throw enough mud at something, sooner or later some of it will stick”. 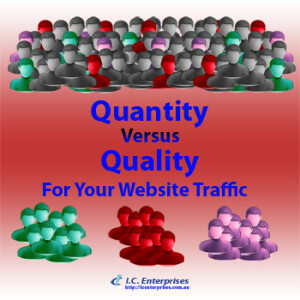 This is the idea behind the quantity side of website traffic. If you can drive thousands of people to your website then eventually someone will buy what you are offering. This is purely a numbers game that works on conversion principals. If you get 100 visitors, and 3 of them buy something, then you have a 3% conversion rate on your website. That means if you get 1000 people, and your conversion stays the same, you will sell your product or service to 30 people. Doesn’t sound too hard does it. Get the people to check out your website and sell to a percentage of them. In the real world however, if you get 100 people to visit your site, and they are “cold” traffic, you will be lucky to make a 1% conversion from them as they are not always buyers. You have done your homework, worked out your ideal customers and where they hang out, and then you directly target them using techniques which encourages them to visit your website. Every day, 10 people come and have a look at what you are offering, and you have already worked out they want that offer. So you get a conversion from your “warm” traffic of 10%. This means out of each 10 people that visit your website, one buys your offer. therefore, using the same formula as above 1000 visitors would equate to 100 sales! This actually happens in the real world when the traffic to a website has been specially targeted as being intereseted or having a defined need for your offer. Which one will work better for your business? Surprisingly, this depends on your business and what you offer. If you have a select type of products or services, say an online hardware store, then the quality method would be better for your business than the quantity model as you could specifically target handymen, tradies, builders, carpenters, all the people that regularly use the products a hardware store provides. That would help make sure that your website visitors already need the products you offer, which will give you a much higher conversion rate. If however you have a business that sells a multitude of unrelated products or services, like a discount or variety store, then the quantity method of traffic generation may be the better one as targeting each products buyer type may be to difficult both time wise and expense wise. So having a lot of traffic to your website could provide enough impulse buyers or bargain hunters to make the lower conversion rate still more worthwhile in the long term. You can also use a combination of the two traffic types to help increase both sales and your online exposure as there are good results for search engine exposure and results to be gained by having a high traffic website. You could create general marketing campaigns that do not target specific groups whilst also having narrowly focused ad campaigns for specific products or services. This will cover both sides of the equation and give you a high traffic website and targeted customers at the same time. I would recommend you reserve your paid advertising for the targeted group and use free resources for the more generic traffic to get the most benefit from this plan. So, quantity, quality or a combination of both, which of these do you use to get traffic to your website and how does it work for you? Please share what works for you in the comments so we can learn from your experience. Very interesting point of view on website traffic and optimizing conversion. I really need to generate traffic to my website! Good info, thanks Ian! Great info. I’ve never been a big fan of the numbers game. It seems like a lot of unnecessary energy to waste on traffic that doesn’t fit my target market. This is most likely because I do have a very specific type of business client I seek to serve. My services aren’t at all general. Great explanation of quality vs. quantity and why you would deploy either strategy. This underscores the importance of knowing your audience – love that you give examples of how to find your audience. thanks for a great post! In my own life, I always go for quality over quantity. Because most of my writing ends up on my site after it is on the Huffington Post or other sites, it seems that I have trusted the people who will be attracted to who I am and what I have to say will find me. My site was truly designed as an “author” site and not so much a business site, and now I am looking at ways to diversify out (especially as I build a health and wellness team) to make other information available to people. Very good information in this post, Ian. Many thanks! Thank you for sharing Ian! 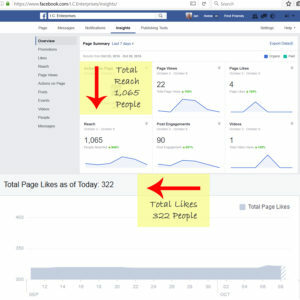 I believe both of the traffic sources are important just depending on who you want to target for your business. So it always comes down to “knowing the purpose and “WHY” part of your business”. Great read! Thanks! Interesting post. I would have to say that I go after quality although sometime the techniques bring quantity. I rather be talking to a small audience who are interested in my products and services. I think a combination of both is ideal for me. I manage a couple of sites and the theatre sites would benefit from quality because we are regionally located, but my business website might do from quantity as we get going. Thank you. I’d have to say both however, I’d start with quality first. Once you get the quality traffic down, that’s time to ratchet it up and reach more of them. Very informative article on directing website traffic. I believe we have the quantity piece as we are constantly marketing and directing clients to our websites. We just have to convert them into paying g clients.